So sorry, didn’t get a pic but was having too much fun to think of it. My Rebecca and I hosted tapas and dinner tonight for three great folks. And it was warm enough to be our first outside meal of the season. A memorable occasion. Well, who was there Felipe? First, Dayna and Catherine (with a C) were here for one of their last meals before boarding the big silver bird to Spain and St John, the start of the Camino Frances! I am so jealous. And they have enough time and money to do the whole thing. Way cool. They are excited and we are excited for them, obviously. They will be sending emails which we will publish here. This is the Springtime Camino and you will be able to see/hear what that looks like. I am so jealous! Then, then, Esther was here. We have been awaiting her arrival to kick off her three month stay here on Vashon. We will make sure to get you as much as possible from her as the season progresses. She is very knowledgeable about all things Camino. I am so excited! I don’t have her facts and timeline complete but she has traveled the Way three times over the years. The first time in 08, the hard way, as in carrying all her gear and staying in the beloved albergues. After that she started to write a book for preteens and walked,bused and taxied through twice to get her facts straight for her writing. My Rebecca, Kelly and I had the opportunity to read the manuscript of her book. Somewhere back there in my archives is a blog post about that I am sure. But anyway, we have known and loved her book for a while now. And that goes for her too. Yea, so we were all together for two hours excitedly talking Camino from all angles. We talked about gear and traveling light which these gals have a handle on. I even advised them to take a couple dressy things, which threw them after all my advice about paring down. Their packs are so light that I think they can afford it and you never know when you have to meet with the Bishop. And we talked albergues and hotels. And we talked about surprises and miracles. I think they are ready. Also they took my little light weight map of the trail that I carried. And my poles are going across with Art in May. All fun. I just know that we all enjoy reliving our Camino experiences one way or another. Relive on, love, Felipe. 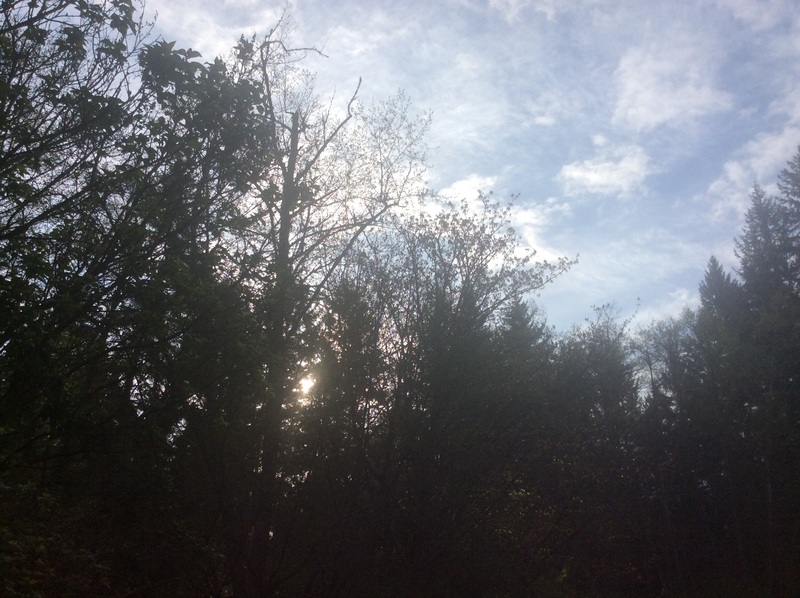 The sun is here for us at the backyard Camino. A few weeks ago we had a lovely visiter to our backyard Camino. It was just before the film crew got here so it got lost in that flurry. But back to the Reverend Bonnie Barnard who stopped to see us and walk and talk with me. I don’t quite how to introduce her other than to say she is a friend, and that is enough around these parts. Our walk was one in which we were arm and arm in short order, just like the Camino ideal. Or talk had the kind of depth, honesty and richness that we all strive for. Sometimes things are just easy. So, I just want to put in a good word for her and her new mission in Scottdale, AZ. She is opening a new spiritual center there and we are praying for her sucess in this outreach. I don’t know dates, addresses or details but she has a website to get all that. So, I don’t know if we have AZ readers to this blog but maybe. Big coming and goings here today. Esther Jantzen is back from a winter in New Mexico and will be here for tapas. Then Katherine and Dayna will be here to walk this morning and they are flying out to THE Camino on Wednesday. And we have our finger on this pulse for you. Father Marc in his homily yesterday had the phrase, “our cockroach hope” which is sticking in my memory and coming up now. I don’t know where that fits in exactly but we will figure it out. What is our cockroach hope here at Caminoheads? So, the start of a new week, a big week, Holy Week. Make it happen for yourself. Yes yes yes loves, Felipe. Wild pear trees in the woods. 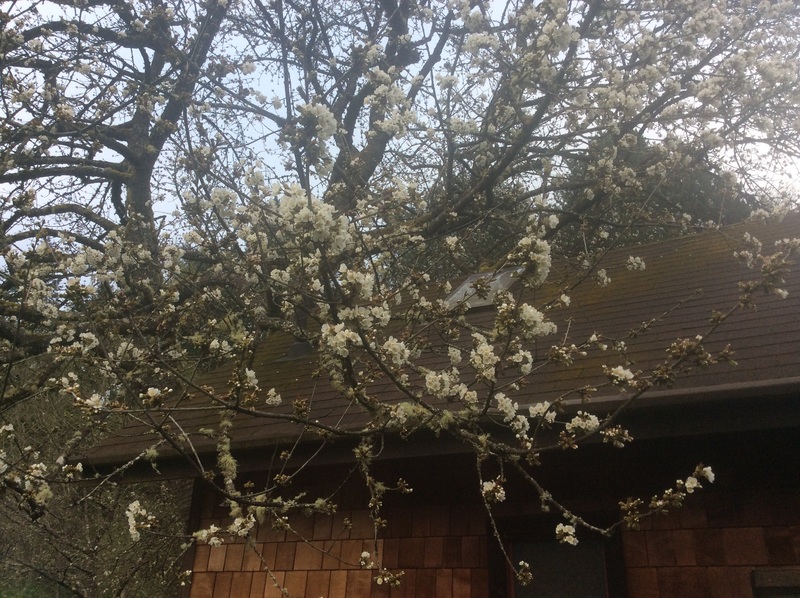 Cherry tree by the house starting to bloom. I was off walking on the backyard Camino with Dayna today. We are just getting to know each other although we are close geographically, as in she is just around the corner. But we discovered that we have this mutual interest in calligraphy which I’m not sure that I have a handle on what it all means. It is basically the art of handwriting but handwriting sounds so simple and art seems complicated. See? I don’t think that I could have said that better if I had tried. That just sort of typed itself. And there on to typing and keyboards and talking to each other as we are communicating right now. I remember my Dad teaching me lettering and a love for communicating in that fashion. I don’t think that we knew the word calligraphy but we had the spirit. Then the excitment in fourth grade to learn cursive (longhand) with the Palmer method. This all sounds like ancient history. But it gets even better! The elementary school that I went to in Buffalo, NY was in two old old buildings. The steps were are cupped, Caminolike, from billions of little feet. You have seen pics with the desks that were wrought iron and wood and screwed to the wooden floor in rows, each had a hole in the top for an ink well. The ink well was a little glass container that once had held the liquid ink and was used with a straight pen to write. The student would dip the nib of the pen in the ink and write a few words and dip again and continue. This is one step more modern then writing with a quill, a feather, gang. And our teacher somehow got into an old storage area and found enough of the pen nibs and holders and blotters and wells to outfit they whole class and we used that stuff the whole year. Timemwise people were just in the transition between fountain pens and on to ball point pens then in the 1950’s. And here we were with this ancient stuff to learn to write cursive with. I was in heaven. So now when I notice a person with a “nice hand” or in other words who takes joy in writing and communicating in that fashion I make sure to compliment them. I think that is what Dayna and I clicked on as we walked the Camino this AM, it was the joy we shared for that particular form of communication. What does this have to do with the Camino anyway? Well, maybe we are talking about taking the time, when we can afford it, to communicate in an artful manner. To say to our audience that beside wanting you to get what I am saying, I value you. I am taking my time to be with you. I am “spending” my time with you. Isn’t that what we did on the Camino where we walked on our blistered feet ever so slowly across Spain. I’m weeping, sorry, love you, Felipe. p.s. – thank you Dayna. It’s really up and doing it. 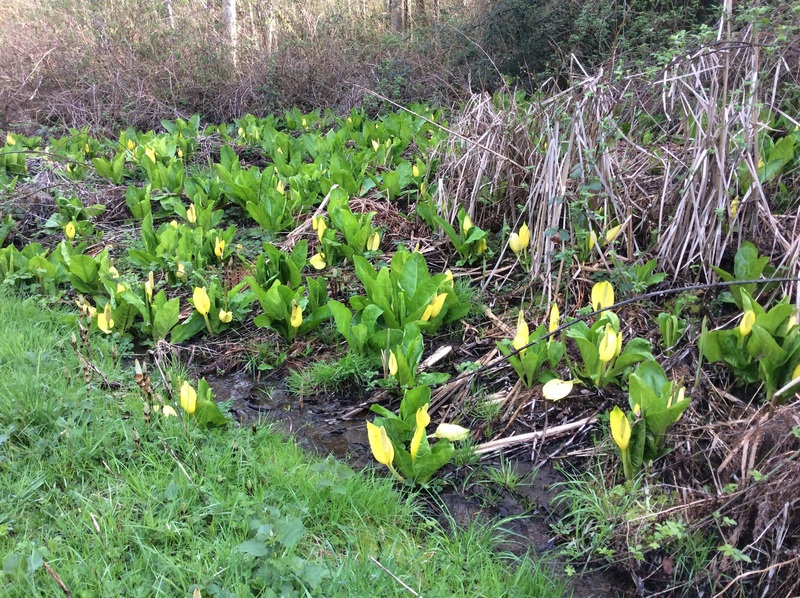 Hopefully this will be the last blog on skunk cabbage for the spring, but you never know. It’s really in it’s prime now, so I thought that I would show you. These plants are about a foot high just so you get an idea of scale. I really wish I knew how many centimeters that is, for some of my friends. 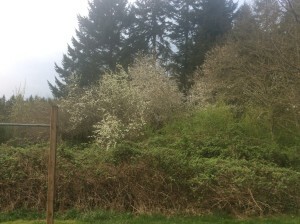 Spring is here on Vashon Island and that is a good thing, as far as I can see. 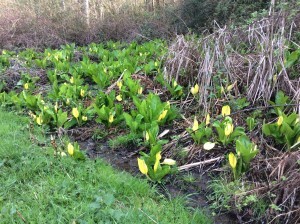 So, this would mean that spring is in some stage along the Camino in Spain and France. Snow melting in the mountains, temps warming up, rain becoming less frequent. Albergues opening up for the new season. Fun to think about. We have Caminoheads going to Spain shortly and maybe they could do some reportage. I will ask. Well, here we are with today being another day in tha saga. What questions do we ask ourselves? 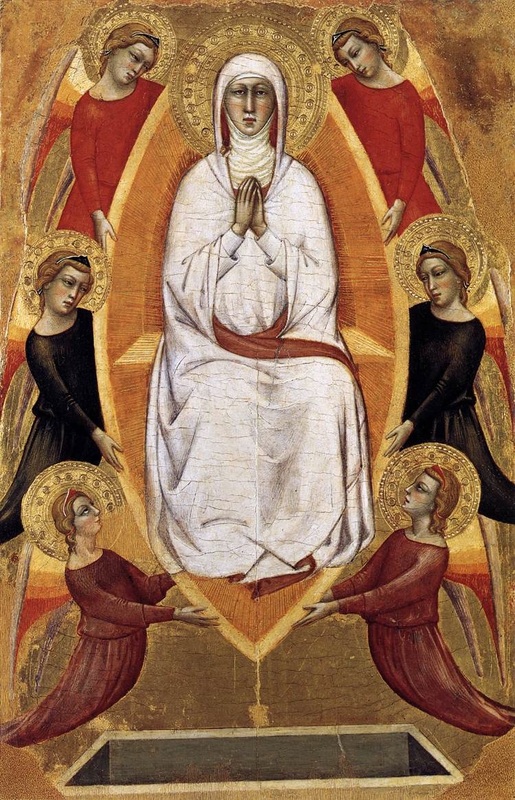 Like, how can I do things to glory of God today? What is the most powerful way to spend this day? What about my fellow man? What about all the creatures around me? And don’t be overwhelmed. Make something happen. Thanks, Felipe. 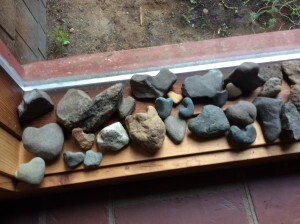 Heart rocks on the windowsill. Alperfect. Yesterday I went to the mainland for treatment at Swedish Hospital but leaving the Island early gave me time for the side trip to Kirkland, WA. I got lost on some quirky little streets there but finally arrived at the studio of Sacred Heart Radio. These are the guys that granted me an interview back in Feburary and was aired here in the Northwest in early March. The station was in fundraising mode and was doing a lot of talk trying to get listeners excited and contributing. Volunteers were taking calls and donations. Pretty fun and I chatted with the volunteers in the inbetween times. At one point I got to be on the air for five minutes to Caminohead along for the listeners. I am turning into such a ham, pretty funny really. So, I thank the folks at Sacred Heart for their hospitality and friendliness. OK, on to Sister Rose Pacatte, who is a Catholic Sister, big time film critic and friend of our beloved Annie. On Annie’s recent visit here she gave me a signed copy of Sister Rose’s book about Martin Sheen (The Way). How nice. I just checked into the Sister’s blog which is huge and awesome and something I need to explore. Just Google Sister Rose and good things happen. Well, am walking here in half an hour. Don’t know if anyone will show up but either way it’s good. Katherine and Dayna are leaving for Spain on the first so they may be here. Yup, keep walking out there, radio frequency loves, Felipe. I am off in a few minutes to go to Swedish Hospital and get my portable chemo pump disconnected that has been my constant companion since Tuesday. I have nicknamed it or him Pancho, like the sidekick of the old TV cowboy show Cisco Kid from way back in the fifties. But before I get there I am going to take a little side trip (my sidekick is going on a side trip) to the Sacred Heart Radio Station. These are the folks that had me do the radio interview which you can listen to on Sound Cloud back a week or so ago on this blog. So, I will be doing some extra driving this AM and I am checking with my guardian angel for her help in the extra morning traffic that I will have to navigate. At some point I realized, after having three hair raising close calls on the highway, that constant worrying about my cancer could be a moot point compared with this source of danger. I am using this in my mentoring with others, and that is that taking up the precious days that we have with worry is cheating ourselves of this unique time. I have heard it said that worry is a tool of the devil and maybe that says it. So the message to you my fearless readers is that we all have precious few days, whether this has been made obvious or not, let’s not waste them with worry about things that are ou of our hands. Have faith that the universe is conspiring in our favor, we just need to realize it and play along. That’s my take. I have to shower and go. So for now, it’s alperfect in the big picture. Oh, but one of my rememberances from the Camino that might be appros and that is in one of the many many churches that Kelly and I visited there was a uniquely different statue of our Mother Mary where she had this big huge smile. The smile was bigger than it needed to be in other words. A message? Did she know something that we have yet to learn? With love to you, Felipe. 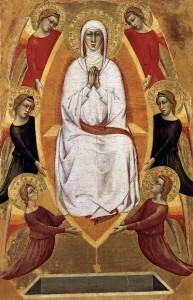 The Assumption of Mary (probably by) Don Silvestron dei Gherarducci ca. 1365.
the foundation of the story about this guy, who “is just a guy”. My only claim to fame is that I answered a call and the rest is the rest… I am surrounded by this incredible constellation of people that are helping me navigate through my present life. 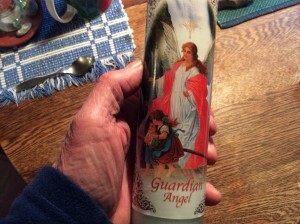 And of course God’s help and inspiration and God’s helper the seemingly ever present St. James are always available. So, that is what we talked about. So, I am really excited that Jessica is going to help me put some improvements on this blog later today. You will see a slightly different look starting tomorrow. Also, we will be connected to other important sources of information and inspiration with live links. Yea, coming soon. So, to you my fearless readers, stay tuned for you never ever know what tomorrow will bring. Surprises ahead! Have a GREAT day, love you, Felipe. Todd and I are talking while we wait for Dr Gold’s appointment. So we are being playful as we enjoy each other. Jess and Annie are coming and going. We have escorts to get us from one place to another. Yea, we are here trying to capture the chemo reality without being too in the way with all the important stuff going on. Just have a minute here in between things and I want to say something to all the folks that send in nice words to me from all over the world via FaceBook and other means. All good, alperfect you all. I’m kind of exhausted after treatment and all the filming projects of the last few days. But I’ll bounce back, that’s what I do. Thanks to you and promise to stay in touch, love Felipe. Hey there Caminoheads! Annie here, writing for Felipe. Wow, what a beautiful time we have been having the last few days. A few years ago I considered myself the luckiest woman in the world when I met the man who would end up being my husband. Still do! Then I considered myself the luckiest woman in the world because I got to be part of Walking the Camino: Six Ways to Santiago, both as a co producer and as a pilgrim in that film. Still do! Now I consider myself he luckiest woman in the world because I am producing Phil’s Camino, starring you know who. That’s right, starring our very own Big Kahuna, or shall I say Big Caminohead, Phil! I’m sure you are all well aware of this project. If by any chance you don’t know about it, check it out at www.philscamino.com . Not only has it been a great pleasure hanging around with Phil but also working with the incredible crew we have assembled. The Team, we call each other. Jessica, Todd, and Rebecca, aka Rocky, are the team and although Rocky couldn’t be here this time she was with us in spirit. Also Dominick who has joined our crew on two occasions now, both times increasing not just the quality of work but somehow lifting the entire project with his quiet vibe of excellence. He is one of those people who just makes you want to be better because he is so good, do you know what I mean? The whole team is like that actually. I want to be the best producer I can be because of how good they are at what they do. Phil asks me sometimes how things got so good, and I just nod and agree instead of answering him. Yeah, tell me about it! I, too, am surrounded by excellence, heartfelt dedication, love and commitment. How about you? Where is the excellence? If it is not immediately apparent maybe it is you! Let’s all just take that on for the day, shall we? Being the excellence everywhere we go. It can look very different from one situation to another, so don’t think this is a ‘set it and forget it’ kind of deal. Nope. You have to figure out what excellence is in each situation, then go for it! So here’s to excellence, whatever it may look like! It would be great to hear from you and hear all about your excellence or the excellence of someone you admire. Buen Camino my friends!